This article is about the Las Vegas Kung Fu – Wushu – Tai Chi tournament which is to be held during the weekend of the mid August in Las Vegas. This article contains the details and schedule of the tournament that were published by the organisation ICMAC which is responsible for organising the tournament. The Las Vegas Kung Fu Tournament is one of the most prestigious tournaments held in the North American continent and aims in encouraging the sacred and most renowned art of self defense called Kung Fu. Kung Fu originated in China over a thousand years ago and it still remains to be practiced and taught in the monasteries in China. The tournament aims at promoting the martial art form, which includes bare hand fighting skills as well as weaponry skills, among the people of the new generation in the west where this form is gaining popularity since the 80s. Following the movie – The Karate Kid, the martial art form gained immense popularity among the people in United States of America as well as the sub continent and thus introduction of competitions like the Las Vegas Kung Fu– Wushu – Tai Chi Tournament which is organizing its 4th annual martial arts competition has already made its spot very firm in the sport world in today's generation. Every martial art tournament around the world is governed by the International Chinese Martial Art Championship or the ICMAC and on the basis of various points and criteria laid down, it rates each of the tournaments with its own rating. If the competitors enroll for a 5 star rated tournament, then he/she gets 100 points for competing in any division while the enrollment on a 4 star or 2 star tournament fetches 75 points and 50 points respectively. The Las Vegas Kung Fu Tournament 2011 is scheduled to start on August 12, 2011 and ending on August 14, 2011 promising the competitors a weekend to look forward to. Having already gained much popularity among the youths of the North American sub continent, the tournament is a perfect opportunity for the youngsters to showcase their talent and also in turn learn from the Kung Fu masters who would be giving training sessions as well as seminars and workshops on the martial art form. The scheduled calendar for the ICMAC Las Vegas Kung Fu Tournament 2011 is as follows. The Friday, August the 12, 2011 is supposed to start of with the registration of interested participants for the workshops and seminars starting at 12 noon local time and open till 8 pm. The seminars and workshops are scheduled to begin at 4 pm onwards where the masters will share their knowledge and expertise on the field of the popular chinese art of Kung Fu to the crowd and following which the mandatory official's meeting and training would be held from 8 pm onwards, which will include the proper education of the match officials and the refrees with the rules of ICMAC and other points and criteria thus laying the foundation of this year's tournament. The Saturday August 13, 2011 will begin with registration for the competition itself from 8:00 am to 9:30 am local time, followed by the opening ceremony from 8:30 onwards. The competition is scheduled to begin at 10:00 am local time and will be terminated at 5:00 pm local time which will mark the end of day one. 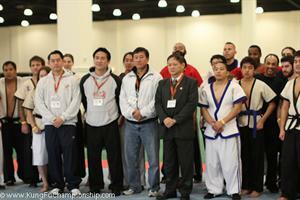 After a break of two and a half hours, the masters and team demonstration will begin at 7:30 pm onwards carrying the competition to Sunday, August 14, 2011 which will witness the medal ceremony followed by the closing ceremony for Kung Fu Tournament 2011 held in Las Vegas.